Know your numbers. High blood pressure affects one in three Americans — and it’s the third leading cause of death in the U.S. This May, celebrate National Blood Pressure Month by raising your awareness with the power of information. Then, use that knowledge to fight unseen, potential risks. 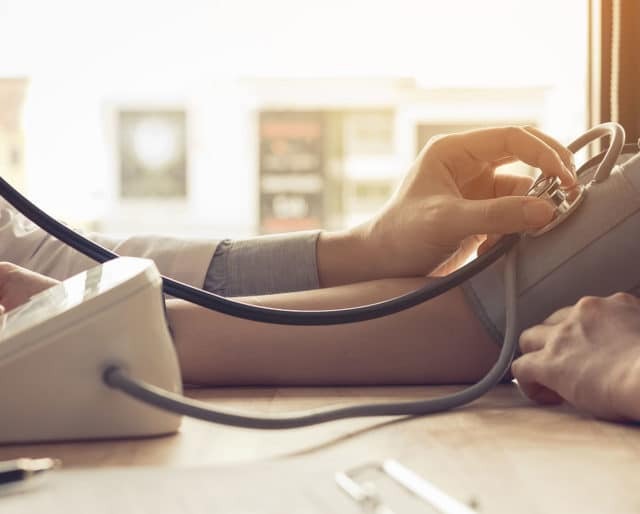 Due to a tendency to show either minor, or even no symptoms at all, high blood pressure has earned the nickname “the silent killer.” Knowledge of one’s high blood pressure — and then taking action — greatly reduces the possible risks of related health problems. French company Withings releases the Smart Blood Pressure Monitor, which can be plugged directly into an iPhone, iPad, or iPod Touch. The measurements are automatically uploaded and synched with the user’s account — making them available to share anytime, anywhere. By bringing Italian physician Scipione Riva-Rocci’s sphygmomanometer to the United States, Harvey Williams Cushing introduces blood pressure measurement to North America and helps spread its use in the Western world. The stethoscope is invented by French doctor René Laennec. This listening device enables the user to tell the difference between the systole and diastole pressures. The first measurement of what was then called “the force of blood” is described by Stephan Hales in his book “Haema Staticks." He uses a water manometer to measure the blood pressure in the arteries of various animals. English physician William Harvey publishes the first study on blood circulation. He comes to the conclusion that the heart acts as a pump. Around 120 over 80 is considered the range for normal blood pressure. Any higher that that means you should try to lower it through some simple lifestyle changes like diet and exercise. One of the best ways to maintain healthy blood pressure is through exercise. A walk, bike ride, swim, jog, or any other aerobic activity will help keep your blood pressure low, and your body healthy. Eating a diet that is rich in whole grains, fruits, vegetables and low-fat dairy products — while avoiding sodium, saturated fat, and cholesterol can lower your blood pressure significantly. National Blood Pressure Month is a good time to practice. We all know that too much salt can elevate your blood pressure, but did you know too little salt can be equally problematic? It's true — if you have congestive heart failure. For those patients, restricting salt to less than 1.8 grams a day can cause blood pressure to soar even higher. Blood pressure readings can vary from one arm to the other. Today, physicians are advised to take blood pressure in both arms. While exercises to lower blood pressure are an important part of heart health, the type of exercise you do is also a factor. The most common cause of high blood pressure with exercise is isometric activity. Straining or excessive weights will cause blood pressure to rise. Many people have blood pressure readings lower than the normal 120 over 80. The only time a low blood pressure reading is a concern is if you’re symptomatic, and experience lightheadedness, dizziness, and fatigue. If this is the case, consult your doctor about necessary lifestyle adjustments. If your blood pressure is high, it’s important to diet appropriately. One especially helpful mineral is potassium — which helps to relax the arterial walls and keep blood pressure in the healthy range. Weight loss is one of the most effective lifestyle changes you can make to control high blood pressure. Losing even a small amount of weight can help reduce your numbers significantly. Regular physical activity and exercise can greatly lower your blood pressure. Simply walking, jogging, cycling, swimming, or dancing for only 30 minutes most days of the week can help keep your blood pressure at a healthy level. Alcohol can greatly affect your blood pressure, and drinking in moderation is important. Generally, that means one drink a day for women, and two a day for men. Keep this mind during National Blood Pressure Month.